So Coldplay was right when they said that you’re stuck in reverse, you have a thousand books when all you need is a single pen. They were right when they sing that words, you’re tired, exhausted (!) but you can’t sleep. Numbers were not 1, 2, 3,… anymore. But a form of a circle where we run over and over again inside of it. We never really move ahead, or forward. We didn’t really achieve anything but headaches, 100 headaches and more when it comes around, that hell. I’m losing the will to get emotional, get sad or happy, get excited or drown, I’m losing the point of being able to feel and have sympathy, this ‘me-me-me generation’ killed my senses. I’m losing any kind of will to really, just put up a smile on my face from time to time for anyone, for that matter. I’m losing the will to fight, to run the battle, to vent, to run, to get lost, to just simply care. Or I just have to be more patient? Either way, how would I know? Up and down now transform into break, burn and born again. Please, my dear world and busy-broken hearted-cursed-blessed-people, may I have my sleep in silence? Can you keep your noises, just for your self? Just this one time. I promise next time I’ll dance your noises along. Like I used to be. Tonight, I just want to go sleep. I hope you would let me, peacefully. why Step Up 3D is the best of it’s trilogy. No. It’s not because of the 3D. It’s a craft works they did in the movie, but it’s not the reason why it’s the best of all. As the third installment in the Step Up Trilogy , and the first shot in 3D, the film follows Moose and Camille Gage as they head to New York University, the former of whom is majoring in electrical engineering after promising his mother that he would not dance anymore. However, he soon stumbles upon a dance battle, meeting Luke and his House of Pirates dance crew and later teaming up with them to compete in the World Jam dance contest against their rivals, the House of Samurai dance crew. Numero uno of whys, for me, the story is no longer about 2 kinds of dance that long to be combined. This time, Dance (apparently is the whole combination of every dance there is) questioned as one of a life choice. Back when I was 5, dancing is an extracuriculer, additional activity my mother asked me to join, to form my body, to keep my healthy good. Plus, maybe she peeked on me when I (supposed to be) dance alone in my room (yeah, most-likely, that is why). Moose, major in Engineering and Dance. Isn’t he cool? Wait until you see him dance, and you will agree with me, no doubt. Secondly, Natalie, the girl who has a classic young-woman-own-her-life-but-not-just-yet character performed as a very good dancer in every musical numbers. From all of those scenes with her in frame, I will never forget this one. With the background is hundreds of Boom boxes (I’m one of those boom box generation too, when you take off your hat for the bass-boom function and party is always on everytime you turn it on), she dance alone, just to warm up. It’s funny because she might be the best dancer-girl in the whole trilogy of Step Up. She got the rhytm right and moves at the right time, for the right directions (thank you for a wonderful Director of Photography who showed me this clearly). Never once she lost beat in those numbers. The last number with Luke that she did on the final competition, is amazing. And I thought they never dance together. Thank God, they did. The biggest treat for the eyes (errr at least, my eyes :P) is always Luke, the main character who has the body of a dancer, the moves of a passionate human and lead his life with so many ways of logical thinking. And yes, he is manly, especially when he dance (how often can you see man dancing and still manly? Only when they’re real dancer, I guess). He apparently has my life, passions for movie and dance, all in the same time. And he’s good looking too. Damn. Last but not least, is the marvelous sets they serves. I mean, most of us know New York, but dancing on the street like Moose did, moving your body proudly in the park of your college, tap your feet down even when there’s water, all you can see only in Step Up 3D. All of dance numbers are expertly choreographed. 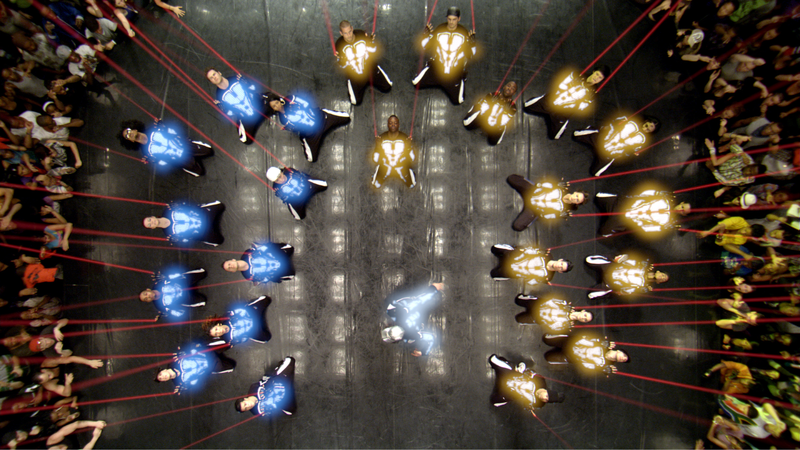 Layers in the choreography serve the 3D technology nicely, and we still have a good portion of depth. This is not a movie about learning the techniques of dance, not about two people falling in love out of life-happens-moments and share their differences on dancing qualifications, try hard to become one. No, this is a movie about what you can do after you realizing your real passion in life. A movie about talent you have and hard work you still need to accomplish to complete your journey. Knowing that to choose one path in your life, doesn’t mean you have to leave another. You will grow a bigger heart, along with the beat and not one single romantic scene goes for nothing, there is connections and character development in each interactions happened. The movie succesfully delivered unforgettable choreography and treated viewers with good visualisation. That’s why Step Up 3D is the best of it’s trilogy.